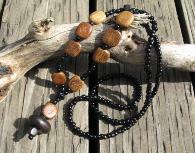 I feel relieved that I can now feel less guilty about wanting to bead if I can consider it meditative. I had not thought of it that way before. *thinks* Does it matter if I’m listening to the Counting Crows?